Ford couldn't export the Mustang to Germany because they couldn't register the name there. So they exported the T-5 Ford instead. 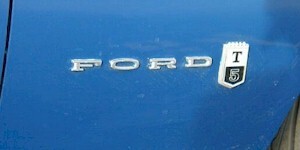 The "Mustang" worded emblems were removed, and "T-5 Ford" emblems were installed. T-5s were sold in Germany from 1964 through the 1979 model year. Here is a rare one. It is a 1967 T-5 Fastback. Ford made 154 T-5 fastbacks for export to Germany. The "Mustang" name could not be registered in Germany, so Ford swapped to T-5 emblems and exported them. Check out the emblem on the fender behind the rear wheel. It says "T5 Ford". Check out close-ups in other pictures in this set. it was originally Sauterne Gold. It still has its original 289ci engine and 3.00 rear. The original T-10 four-speed manual transmission has been replaced with a new Tremec T5Z five-speed.